A couple weeks ago I discovered this bug crawling among my herb planter on the deck. Although it wasn’t large, about the size of your index fingernail, it was vibrantly coloured, and really rather hard to miss. I recognized it as being a bug. That is, a true bug, a member of the order Hemiptera, rather than a bug in the colloquial sense of the word (though it is also that, of course). The dual use of the word can cause some confusion, and is the reason that the word “true” generally prefaces “bug” when speaking in a specific sense. 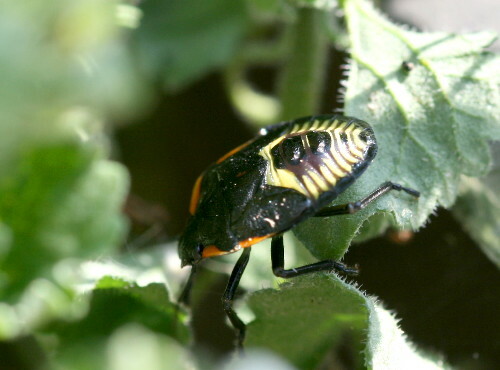 The Hemiptera include a wide variety of insects, from cicadas to leafhoppers to shield bugs and others. The group is defined by the presence of a long stiff “beak” or proboscis, which is really the mouthparts and mandibles of other insects evolved and modified into a long tube. They use this beak to pierce plants for food, usually sap. 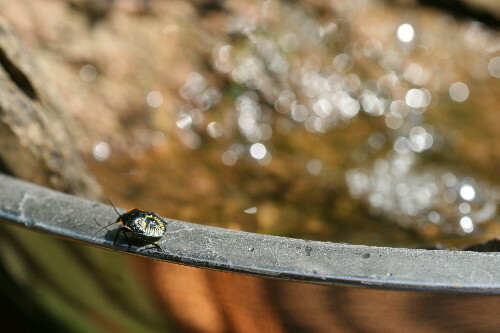 Also, the name Hemiptera reflects their special wing structure – “hemi” means half, and “pteron” means wing. Rather than the familiar membranous wings of most insects, the basal half of Hemipteran wings is opaque and hardened. I also knew that it was probably a shield bug, based on its shape (which also gives the group, the family Pentatomidae, its common name). 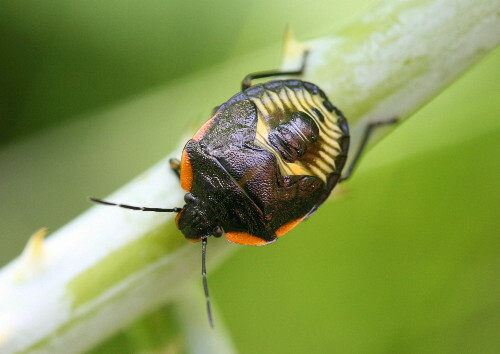 The shield bugs are also known as stink bugs because they possess glands on the underside of their middle segments that, when disturbed, are capable of releasing a pungent liquid that contains cyanide compounds. Fortunately, I didn’t have the opportunity to experience it firsthand, as none of the bugs I encountered did this. Interestingly, the bright colours of the nymph are suggestive of aposematic colouration, and I wonder if it’s a reflection of these cyanide compounds. However, I was confused when it came to species. I couldn’t spot anything that quite matched in my guide, and when I looked closely at the bug, the apparent lack of wings seemed odd. It seemed like it had a raised button right in the middle of its back. I saw a few more, here walking around the rim of my water fountain, others among the blackberry canes in front of the house; it seemed reasonably common, at least here. Some poking around on BugGuide.net eventually revealed them to be nymphs, which is why I wasn’t sure what they were, and why they didn’t appear to have wings. I discovered this mangled mess hanging off a leaf of my sunflower plant yesterday. I believe it’s the cast-off skin of one of my mystery bugs. 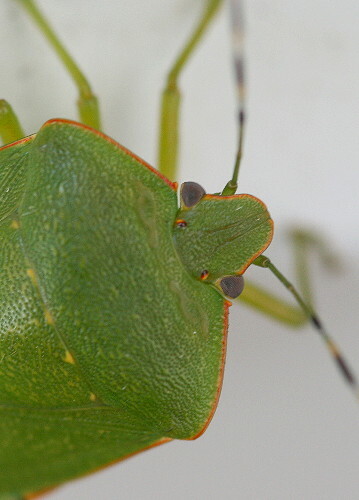 The species is the Green Stink Bug, usually labeled Acrosternum hilare. Based on the BugGuide.net page, the bright nymphs seem to be in their 5th instar (larval stage), which is the final one. In each larval stage they change colour and pattern just slightly. Some will become nearly green in their final instar, while others will remain these bright colours. Yesterday evening I ran my moth lights, and found these guys who had come in to the sheet. It’s the adult form of the species, and is larger than the nymph, maybe the size of my thumbnail. I hadn’t seen any even just the night prior, so perhaps one of the ones at the sheet is the owner of the shed skin hanging from my sunflower. They’re dramatically different than the larval form, and although the species is depicted in the Kaufman guide to insects, the nymph isn’t, so I didn’t recognize it. Kaufman does an admiral job with the guide, but there’s still only so much one can reasonably depict in a single guide to insects. 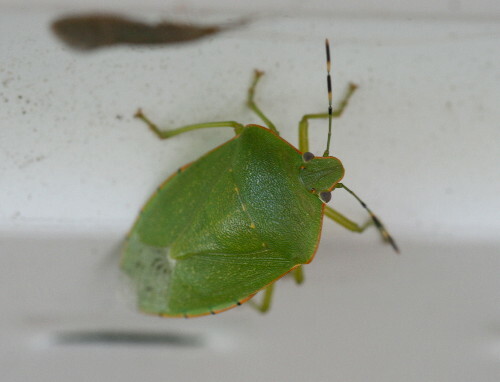 The Green Stink Bug is a common bug through much of North America. It feeds on a wide variety of plants, and is found in a range of habitats, throughout most of the year. Here in the north they just have one brood, but in southern, warmer areas they can have two. These nymphs and adults probably belonged to our one hatch here. Their eggs are attached to the underside of a leaf in two rows, and are often described as “keg-shaped”. Incidentally, in the above photo you’re able to see the “half-wings”, with the lower half of the front wings looking like it’s protruding from a cover like a beetle’s elytra (really, the “cover” here is the upper half of the front wing). The wings are termed hemelytra for their resemblence to the true elytra of beetles. There’s a second species in the south that looks very similar to this, but has red-striped antennae instead of black. Both can be significant agricultural nuisances given their wide range of food preferences. Often they’ll develop a taste for seeds, and will target growing crops such as corn, soybeans, beans, peas, tomatoes and others, before the veggies are yet ripe (doesn’t go over well with farmers, understandably). When they’re not aggravating crop farmers, they’re off tormenting orchard growers, as they’ll happily feed on the stems and foliage of other plants, particularly apple, cherry, orange and peach trees. They are one of the guilty culprits responsible for “catfacing” on fruit such as peaches and tomatoes. They’re a particularly hardy bug and don’t respond to pesticides. However, they use a particular pheromone to communicate that can be artificially produced and used to draw adults away from crop areas. They’re also parasitized by a tachinid fly, but that would be a bit harder to ensure it worked. It’s interesting to get to see the life cycle of something like that (even if I did miss out on the egg and early stages). All too often we get a fleeting glimpse of the insect, usually in its adult form, and are left to wonder about the rest of its life history. Ruth over at Body, Soul and Spirit has a really cool video of a monarch caterpillar shucking its skin and turning into the pupa that precedes the chrysalis, which I highly recommend checking out! It took me over half an hour to download on my dial-up connection, but was very much worth the wait once it was completely loaded and I got to watch it. Thank you much for posting this. I was shooting photos of this bug the other day. I remember seeing the colorful form of it in my youth in various instances. I never knew it was part of a larval form. I figured I would have a hard time finding out what it was by just typing in the color description into google, but you made it easy to find. Over at “Cody Bear’s Friends”, Goodbear had a couple of posts earlier this summer concerning pentatomids that smell (taste?) like cinnamon. Are we in Ontario so lucky, or do we just get the stinky ones? That is so cool to think that at each instar the bug changes colour. Entomology has got to be one of the most antidepressive activities possible. 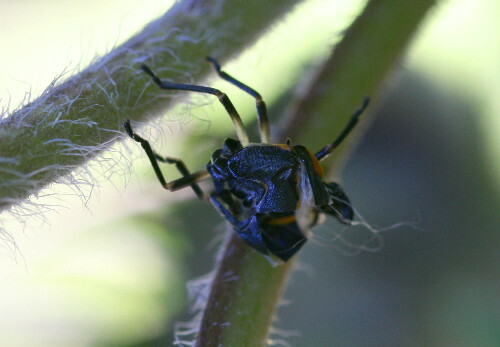 I think I have LOTS of these bugs on one of my plants. I have been simply plucking them off (Ok, I use sicissors and cut off a bit of the stem) and toss them into our weekly debris collection. Should I be doing this? I really hate to kill things, even bugs sucking the juices out of my nice California native plants. They are rather pretty bugs, actually. Mine are green with black and reds lines and spots. Thanks for the ID on this little guy!